Takeda Shingen 武田信玄 original name Takeda Harunobu, (December 1, 1521 – May 13, 1573) of Shinano and Kai Provinces, was one of the preeminent daimyo (feudal lords) who sought to take control of Japan in the late stage of the Sengoku, or "warring states," period. Born Takeda Katsuchiyo, the eldest son and heir of Takeda Nobutora, head of the Takeda clan and daimyo of the province of Kai, he rose up against his father at the age of 20 and had him exiled under the surveillance of a rival clan. He changed his name to Takeda Shingen and set about consolidating his power by conquering Shinano, then attempted to expand his dominion. Five inconclusive battles fought between Takeda’s forces and the Uesugi armies on the Kawanakajima plain in northern Shinano in 1554, 1555, 1557, 1561, and 1564 became the subject of numerous folk tales and legends. Takeda Shingen was distinguished by his aggressiveness in battle and his skill as a strategist and military leader. He also instituted innovative systems of law, taxation and administration in his government, which were later borrowed by Tokugawa Ieyasu and incorporated in the Tokugawa shogunate which united Japan. His greatest project was a dam across the Fuji River. Takeda Shingun was the only daimyo with the military and tactical ability to defeat Oda Nobunaga and Tokugawa Ieyasu in their ambitions to control all of Japan, and might have done so if he had not died suddenly in 1573 of illness or a musket wound. Shingen’s life has been a favorite subject of Japanese art, literature and drama and his story was featured in several modern films and television dramas. Takeda Shingen was born the son of the warlord Takeda Nobutora (1493 – 1573), who had aggressively secured a stronghold in Kai Province and built Yogai-jo Castle at his headquarters in Fuchu. In 1521, Takeda Nobutora had just defeated an Imagawa general, Fukushima Masashige, at the Battle of Iidagawara, when he learned of the birth of his first son. He named him Katsuchiyo. Later, Katsuchiyo was given the formal name of Takeda Harunobu, a change authorized by Ashikaga Yoshiharu, the twelfth Ashikaga Shogun. In 1559, he changed his name again to Takeda Shingen. Shin is the contemporary Chinese pronunciation of the character nobu, which means "believe"; gen means "black," the color of intelligence and truth in Buddhism. Shingen is sometimes referred to as "The Tiger of Kai" for his martial prowess on the battlefield. His primary rival, Uesugi Kenshin, was often called "The Dragon of Echigo" or "The Tiger of Echigo Province." In Chinese mythology, the dragon and the tiger have always been bitter rivals who try to defeat one another, but always fight to a draw. Takeda Katsuchiyo was born December 1, 1521, the eldest son of Takeda Nobutora, leader of the Takeda clan and daimyo of the province of Kai. At a fairly young age Shingen began to assist his father with the older relatives and vassals of the Takeda family, and became a valuable asset to the clan. When Katuchiyo reached his thirteenth birthday, his father arranged his marriage to a daughter of Ogigayatsu-Uesugi Tomooki, who held considerable territory in the Kanto region. The young woman died just one year later. In 1535, a large ceremony was held to celebrate Katsuchiyo's coming of age, attended by a number of court notables, including Sanjô Kinyori, a retired Dainogon, whose daughter Katsuchiyo would soon marry. The Shôgun, Ashikaga Yoshiharu, gave his permission for Katsuchiyo to incorporate 'Haru' in his adult name, and Katsuchiyo thus became known as Harunobu, and he also received the honorific title Shinano no Kami. Takeda Nobutora apparently disliked his son, particularly after Harunobu’s heroism helped to defeat Hiraga Genshin in 1536, and planned to name his second son, Takeda Nobushige as his heir instead. In 1541, Harunobu suddenly rose in rebellion against his father, supported by a large number of his father’s retainers. Nobutora submitted with minimal bloodshed and was exiled by Harunobu to Suruga (on the southern border of Kai) under the custody of the Imagawa clan, led by Imagawa Yoshimoto, the daimyo of Suruga. After assisting in this bloodless coup, the Imagawa formed an alliance with the Takeda clans. By the age of 21, Harunobu had successfully taken control of the Takeda clan. His first act was to gain a hold of the area around him by conquering Shinano Province. A number of the major daimyos in the Shinano region marched on the border of Kai Province, hoping to neutralize the power of the still-young Harunobu before he had a chance to impinge on their lands. They planned to defeat him at Fuchu, where they had heard that Harunobu was gathering his forces for a stand, and were unprepared when Takeda forces suddenly ambushed them at the Battle of Sezawa. Taking advantage of their confusion, Harunobu was able to score a quick victory, which set the stage for his drive into Shinano lands that same year. The young warlord made considerable advances into the region, conquering the Suwa headquarters in the siege of Kuwabara before moving into central Shinano with the defeat of both Tozawa Yorichika and Takato Yoritsugu. However, the warlord was checked at Uehara by Murakami Yoshikiyo, and lost two of his generals in a heated battle which was won by Murakami. Harunobu managed to avenge this loss and the Murakami clan was eventually defeated. Murakami fled the region, and presented himself before Uesugi Terutora to protest the Takeda aggression and plead for help. After conquering Shinano, Harunobu (who had changed his name to Shingen in 1551) faced another rival, Uesugi Kenshin of Echigo. In June and October of 1553, the Takeda and Uesugi armies fought near the Kawanakajima plain in northern Shinano. Though the two sides withdrew after brief, inconclusive skirmishes, the feud between their leaders became almost legendary, and they faced each other on the battlefield of the Kawanakajima five times, in 1554, 1555, 1557, 1561, and 1564. A total of five times at the battles of Kawanakajima. These battles were generally confined to controlled skirmishes, neither daimyo willing to devote himself entirely to a single all-out attempt. The fiercest conflict between the two, that might have decided victory or defeat for one side or the other, was the fourth battle. From this fourth contest came the famous legend that describes Uesugi Kenshin's forces clearing a path through the Takeda troops until Kenshin engaged Shingen in single combat. According to the tale, Kenshin attacked Shingen with his sword, while Shingen defended himself with his iron war fan (gunbai). Both lords lost a considerable number of men in this fight, and Shingen in particular was deprived of two of his main generals, Yamamoto Kansuke and his younger brother, Takeda Nobushige. Around this period, the Takeda clan suffered two internal setbacks. Shingen uncovered two plots on his life, the first in 1560 by his cousin Katanuma Nobumoto (whom he ordered to commit seppuku, ritual suicide), and the second, a few years later in 1565, by his own son Takeda Yoshinobu. His son was confined to the Tokoji, where he died two years later. It is uncertain as to whether his death was natural or ordered by his father. Takeda Shingen was left, for the moment, without an heir; he later had more sons, and it was his fourth son, Takeda Nobumori, who took control of the Takeda clan after his death. By 1564, after he had completely conquered Shinano Province and taken a number of castles from the rival Uesugi clan, Shingen kept his realm fairly contained, contenting himself with a number of small raids and mostly internal affairs. During this time he ordered a project to dam the Fuji River, the largest and most ambitious of his many innovative domestic endeavors. It became Shingen’s greatest historical achievement, and its benefits far outlasted his military and political influence. After Imagawa Yoshimoto (a former ally of the Takeda) was killed by Oda Nobunaga, Shingen made a move against the Imagawa clan, which was weakened under the incompetent leadership of Yoshimoto's son, Imagawa Ujizane. A pact is believed to have been formed between Shingen and Tokugawa Ieyasu to conquer and divide the remaining Imagawa lands (Tôtômi and Suruga),, and they both fought against Yoshimoto's heir. However, the agreement between the Takeda and Tokugawa forces quickly fell through after the Imagawa clan was dealt with. The Hojo clan of Sagami opposed the new balance of power and sent troops to defy Shingen, which they succeeded in doing for about one year. Then, in 1959, Shingen invaded Sagami and besieged Odawara, the Hojo capital. Though this effort lasted only a week, on their way back to Kai, Shingen’s forces crushed an attempted ambush by the Hojo at Mimasetoge. In 1570, the Takeda now dominated Kai, Shinano, Suruga, and pieces of Kozuke, Tôtômi, and Hida. Takeda Shingen, now 49 years old, was the most important daimyo east of Mino, and the only one with the power and tactical ability to halt Oda Nobunaga’s relentless quest for national hegemony. In 1570, the formidable Hôjô Ujiyasu died and his heir, Ujimasa, quickly made peace with Shingen. Oda Nobunaga and the Tatakeda clan, after an abortive attempt at a diplomatic alliance intended to check the power of the Uesugi, engaged in a war of words which may have involved the shogun, Ashikaga Yoshiaki. In 1572, Shingen launched an attack on Tokugawa Ieyasu’s forces in Totomi, and captured Futamata. 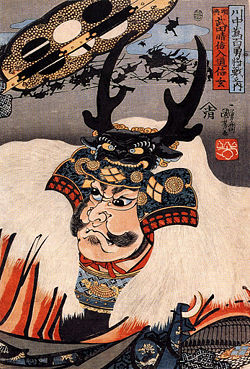 The following January, Shingen returned to Totomi and engaged Tokugawa Ieyasu's forces at the battle of Mikata ga Hara. At the Battle of Mikata-ga-hara, fought on January 6, 1573, Takeda Shingen defeated a small combined army of Nobunaga and Ieyasu, but the victory was not decisive. Shingen was apparently testing the responses of Oda Nobunaga and Tokugawa Ieyasu. A few days after the battle, when news reached Shingen that Asakura Yoshikage had elected not to attack Oda Nobunaga, he broke camp and returned to Kai, granting Tokugawa Ieyasu a reprieve. After Takeda Katsuyori became the daimyo of the Takeda clan, he was ambitious to continue his father’s campaign and moved to attack Tokugawa’s forts. The allied forces of Tokugawa Ieyasu and Oda Nobunaga dealt a crushing blow to the Takeda in the Battle of Nagashino. Oda Nobunaga's gunmen destroyed the Takeda cavalry, and Tokugawa Ieyasu seized the opportunity to defeat the weak Takeda, led by Takeda Katsuyori, in the battle of Temmokuzan. Katsuyori committed suicide after the battle, and the Takeda clan never recovered its strength. The loss of Shingen's heir, Katsuyori, almost totally destroyed the Takeda clan. However, Shingen had had a profound infuence on Japan. Many lords adopted his legal system, and his methods of taxation and administration. Takeda Shingen did not exhibit cruelty to the same degree as other warlords, but he was aggressive toward military enemies and many legends arose about him. His war banner contained the famous phrase, taken from Sun Tzu's “The Art of War,” “Fū-Rin-Ka-Zan” (風林火山) (Swift as the Wind, Silent as a Forest, Fierce as Fire and Immovable as a Mountain). The phrase characterized both Shingen's political policies and his strategy in warfare. Upon learning of Shingen's death, Kenshin reportedly cried at the loss of one of his strongest and most deeply respected rivals. 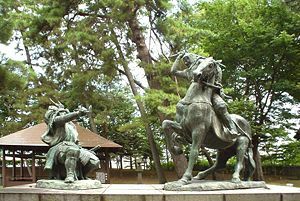 One of the most lasting tributes to Shingen's prowess, however, was probably Tokugawa Ieyasu himself, who is known to have borrowed heavily from the old Takeda leader's governmental and military innovations after he took over the leadership of Kai during Toyotomi Hideyoshi's rise to power. Many of these ideas were put to use in the Tokugawa Shogunate. 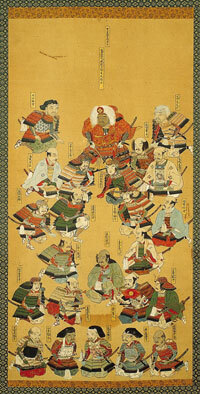 The Twenty-Four Generals of Takeda Shingen. During Edo period, 24 retainers who served under Shingen were chosen as a popular topic for Ukiyo-e and Bunraku. The names of the retainers vary from work to work; the following list is the popularly accepted version. of retainers. Not all of the retainers served together, as some had died before others joined the Takeda, but each was noted for his exceptional contributions to Shingen and the Takeda family. 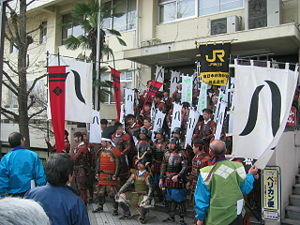 The Takeda Shingen festival takes place the first weekend of April in Kofu. Usually a famous Japanese TV actor is hired to play the part of Takeda Shingen. There are several parades going to and from the Takeda Shrine and Kofu Castle, reflecting the different comings and goings of Takeda Shingen during his life. These reenactments are taken very seriously, and participants practice all year for the annual event. The 1988 NHK Taiga drama television series Takeda Shingen was a fictionalized account of his life, with Kiichi Nakai in the title role. Akira Kurosawa's 1980 film Kagemusha was also inspired by Shingen’s life; it drew worldwide attention to the theory that Shingen died of a musket-wound. Takeda Shingen appears in Toshiro Mifune's historical film “Samurai Banners” (風林火山 Furin Kazan). The film is a depiction of the life of Shingen advisor Yamamoto Kansuke from 1545-1562. In this movie it is suggested that it was Kansuke's idea for Shingen to marry Lady Biwa. Takeda Shingen appears in the epic film Heaven and Earth (1990), about the fourth battle of Kawanakajima as seen from Uesugi Kenshin's point of view. In the Japanese science-fiction film Sengoku Jieitai (1979), in English known as Time Slip and G.I. Samurai (1979), a group of Japanese Defese Force soldiers, who are stranded in the sixteenth century by a freak timeshift, take on his forces. Takeda Shingen is subsequently killed in a duel with the soldiers' leader, Lieutenant Iba (performed by Sonny Chiba). Takeda Shingen also appears as a character in several video and computer games. ↑ Rizō Takeuchi. Nihonshi shōjiten (A Concise Dictionary of Japanese History). Tokyo: Kadokawa shoten, 1985. ↑ Masayoshi Arai. Nihonshi Jiten (Dictionary of Japanese History). Tokyo: Ōbunsha, 1987. Ryavec, Carole Ann. 1986. Political jurisdiction in the Sengoku Daimyō domain: Japan, 1477-1573. Sakai, Atsuharu. 1940. The memoirs of Takeda-Shingen and the Kai-no-gunritsu. Cultural Nippon, XXVII. Tokyo: Nippon bunka chuo renmei (Central Federation of Nippon Culture). This page was last modified on 12 November 2015, at 15:39.